From your "Property list" you can perform several actions on more properties at the same time. 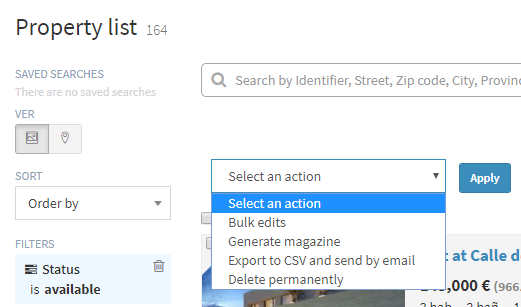 In addition to generating a magazine, exporting them to a CSV file, deleting them permanently from your database, you can also edit them simultaneously. Modify fields you need and click "Save" to apply your changes on properties selected before. If you need to know how to select properties that you want to modify from the "Property list", read more.